Until yesterday, I hadn’t been aware of any relatives who experienced the Holocaust in person, whether they ultimately survived the horror or not. My first discovery came yesterday, and it’s due to Google Books. If Google did not make the effort to digitize rare books from around the world, it would have taken me a lifetime to discover references to my relatives, and that’s assuming I would discover it at all. Because Google has made the text of these books fully searchable, even if the full book isn’t available for viewing online, it can point researchers in the right direction, towards information that would be buried otherwise. It also makes sense for researchers to continue searching. 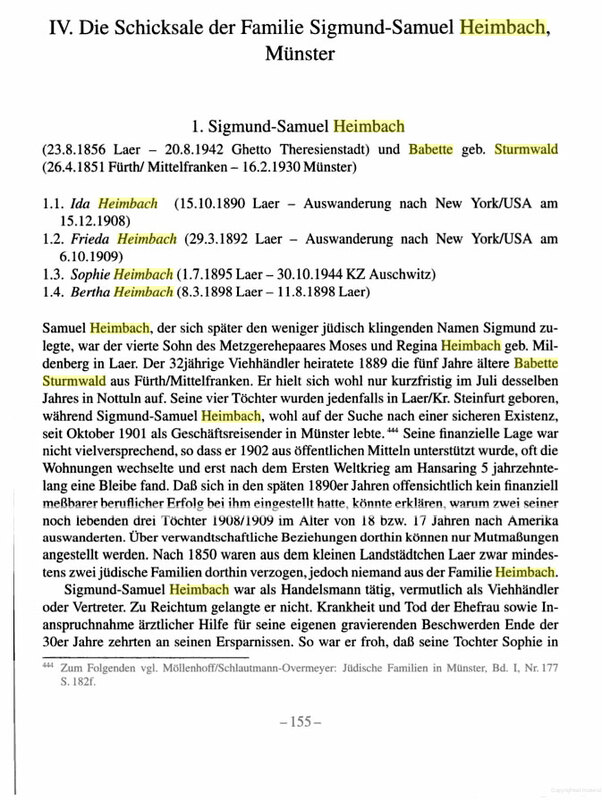 I’ve searched Google Books for references to Sturmwald before, but yesterday’s new result provided new information about my relatives in Germany. The first result new was several pages from the book, Stadtführer zu Orten ehemaligen jüdischen Lebens in Rheine [City Guide to Former Places of Jewish Life in Rheine]. The pages referred to Babette Sturmwald, born in 1856 in Laer, which is near Steifurt and Münster in Germany. The book contains a record of her family: her husband, Sigmund-Samuel Heinbach, and their four daughters, Ida, Frieda, Sophie, and Bertha. The book notes that the first two daughters, Ida and Frieda, emigrated to the United States, and even offers the dates they departed. 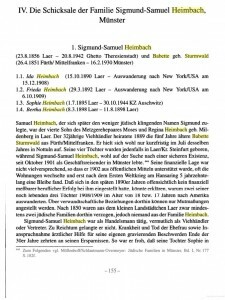 According to the book, Sigmund-Samuel Heimbach died at the Theresienstadt ghetto in 1942 a few years before Sophie, who had also been moved initially to the Theresienstadt ghetto, perished at the Auschwitz concentration camp. After discovering this, I turned to Yad Vashem to see if there were any additional records or documentation of Sigmund’s and Sophie’s experiences in Theresienstadt or Auschwitz. 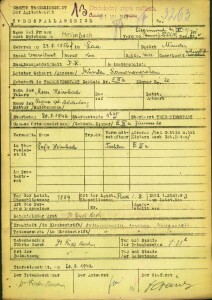 Their names appear in the Central Database of Shoah Victims’ Names had more information that helped with the research, both sourced from a book called Victims of the Persecution of Jews under the National Socialist Tyranny in Germany 1933 – 1945. 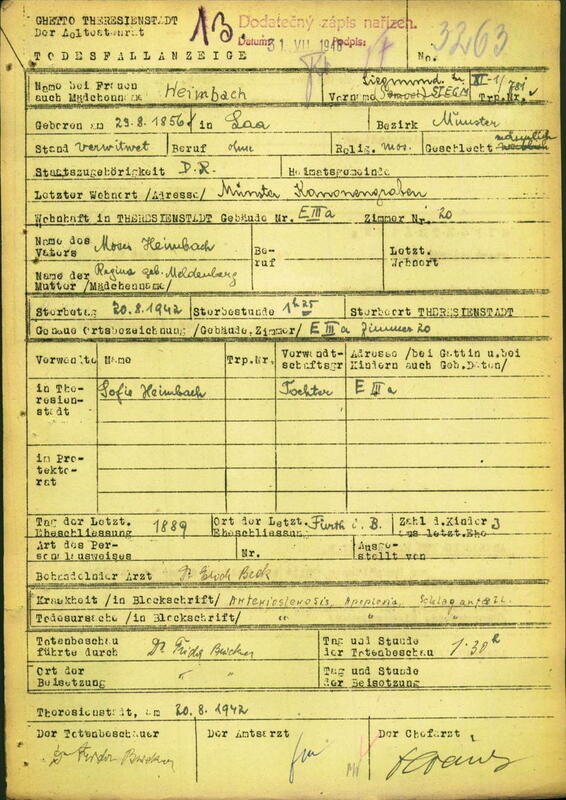 Sigmund’s entry also included a Nazi death certificate, included here. 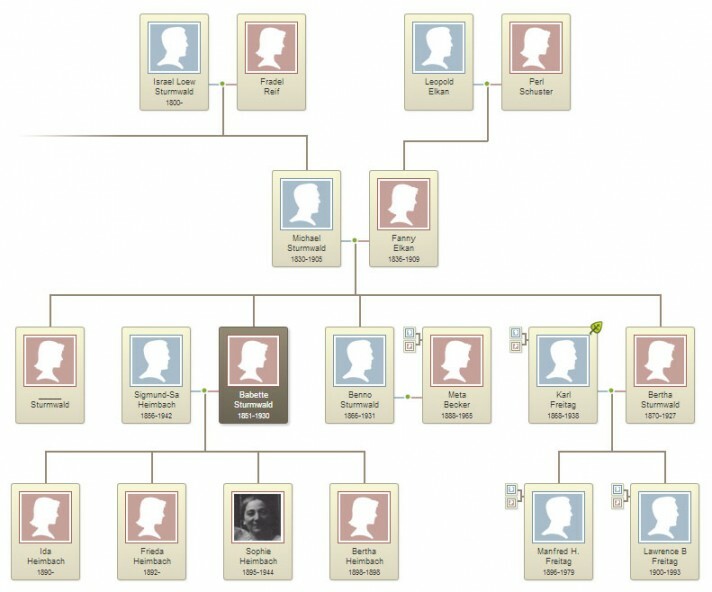 Until this point, I knew that Sigmund and Sophie, as well as Babette’s other children, were descendants of a Sturmwald, but I wasn’t sure about how they fit into the family tree. By tracing Ida Heimbach’s journey to the United States, I found exactly what I needed. In the ship manifest, Ida indicated her destination was her aunt in the United States, Bertha Freitag. I took this at face value. I had already understood that Bertha Sturmwald Freitag had two siblings who remained in Germany. This information places Babette Stumrwald Heimbach, Ida’s mother, as Bertha Sturmwald Freitag’s sister. As a result, Ida and Sophie are both second cousins, three times removed. Now Babette and her family, some of whom perished in the Holocaust, have their places in my family tree. It’s distant, but considering I still expect some of my closer ancestors to have siblings, who I’m not aware of, and who remained in Europe. I’ll just keep searching, and maybe an obscure book somewhere, newly scanned by Google Books, will reveal new details. Typically, the only way to discover detail like these is to visit libraries around the world and read thousands of books. That’s certainly not a guaranteed method of research; I could read tens of thousands of books and never find anything pertaining to my family — or I could read something unrelated and not know until later that some of the information did in fact pertain to my family. Grand efforts to digitize and index historical libraries is the only hope most people have for discovering information that would ordinarily be lost to history.